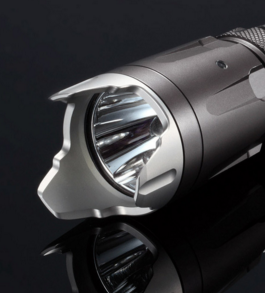 If You’re Choosing A Survival Flashlight Consider Following These Tips. The thing about survival situations is they’re not going to happen and then operate on your schedule. Survival situations are inconvenient, and if Murphy’s law holds up, they’re actually going to happen when it’s the most inconvenient. A convenient situation would be where a SHTF situation takes place and lasts for just a few short hours during the day time. The more likely outcome is whatever circumstances you find yourself in will extend well past the setting of the sun and last into the night. If you’re lucky it’ll just be one night. But, more than likely we’re going to be talking about several nights, if not weeks or months. And because this is a stark reality you need to come to terms with why choosing a survival flashlight needs to be high on your list of priorities. Now here’s where I’m going to present you with some good news. Choosing a survival flashlight isn’t difficult, it’s not as expensive as you’d expect and if you follow the tips I offer you’re going to be extremely satisfied with whatever light you choose. I wouldn’t go far as to say Survival Flashlights are a dime a dozen, general use flashlights might be, but ones used for emergency use are as plentiful as they are varied. That’s why when you go out there looking for one keep this checklist on hand to see how many qualities the light you’re looking at possesses so you know the light you’re getting can perform up to task. It really, really matters how durable the light you select was designed to be. That’s because a survival flashlight will likely be exposed to the worst mother nature (and people) can throw at it. This means instead of picking up a cheaply made light from somewhere like WalMart, you’ll want to do your homework and find one that’s made out of material that’ll protect internal elements in case it’s dropped on the ground or in water. So obviously you’ll want to select a flashlight that is drop resistant and waterproof. Part of that selection process comes down to analyzing the flashlight’s casing. And while plastic is a popular casing material it’s not a good fit for a survival light. Instead look for a survival flashlight that’s either metal, or a blend of intense rubberized plastic and metal. Metal provides a protective barrier for the sensitive electronics, it can withstand abuse and won’t crack under pressure. And rubberized flashlights are great at absorbing impact of mishandled. The cool thing about most rubberized flashlights is there is generally an external rubber layer around a metal housing…giving you the best of both worlds. In terms of the best metal to look for many of the better lights are built with aluminum. Aluminum is lightweight and strong and will last for a long, long time. Also in terms of durability you’ll want to look to see if your flashlight is waterproof. 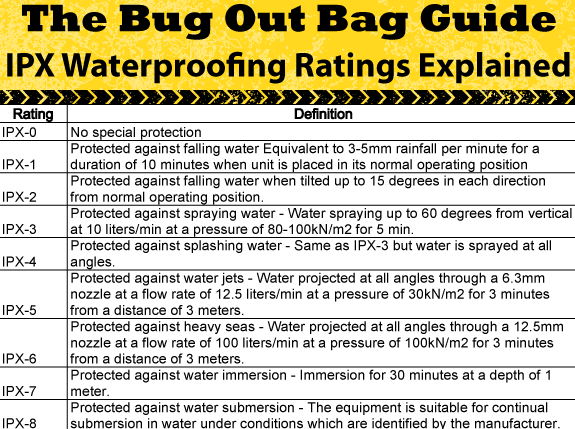 Flashlights are rated on a scale known as the IPX waterproofing scale. Depending on the rating you’ll know just how much water your light can withstand. Check out this image below showing you what IPX ratings mean. Obviously the higher the rating the better, but, most survival flashlights with a rating of IPX-6 or greater will work. 2 – Battery type: So after checking durability out you’ll want to see what kind of battery the light takes. Here’s the thing about a majority of the flashlights out there advertised as survival lights. 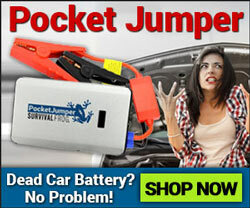 Many of them take obscure battery types that are generally only found online or in specialty stores. Manufacturers have their reasons for using those kinds of batteries but let me tell you something…trying to get extra batteries in a survival situation that are already hard to come by is going to be near impossible. That’s why I recommend choosing lights that use conventional battery types (AAA, AA, C and D). These are going to be a heck of a lot easier to find in a survival situation and they’re going to help you produce dependable light when you need it. And when it comes to the type of standard battery your flashlight should use I’d say go alkaline. They’re cheaper, more common, and have a fair amount of power and longevity. 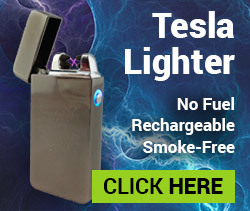 If you can find a light that accepts both alkaline and more advanced batteries (like nickel cadmium and Lithium-ion) I won’t try and dissuade you from getting them, just remember alkaline’s the cheapest option. Alkaline batteries can corrode if brought into contact with certain elements or if damaged. So, make sure to check your batteries in your light frequently to ensure they haven’t corroded and aren’t damaging your light. 3 – Bulb type: There are a few different choices when it comes to bulb types. The main ones are incandescent and LED. Incandescent are the tried and true models and LEDs are relatively new when it comes to flashlight tech. A few years ago I would have recommended going with an incandescent bulb based on price alone. However, now that LED bulbs have seen a dramatic drop in price I can wholeheartedly recommend flashlights with an LED bulb. In fact, at this point I wouldn’t even recommend an incandescent model. One of the first reasons is LEDs are substantially brighter then their counterparts. They’re also less demanding in terms of energy usage, they’re quite a bit smaller than bulbs and they’re also far more durable and last a lot longer. The typical LED bulb will last around 10,000 hours where as an incandescent bulb will die within a few hundred hours of use. Ultimately you’ll be much happier going with an LED flashlight. One question you might ask is “are more LEDs better than one?” And the answer is not necessarily. A lot of the time a flashlight with multiple LEDs will have smaller, cheaper LEDs that aren’t as powerful as a singular bulb. Plus, the power that’s split between the battery and the lights might not be utilized with the same kind of efficiency. And in other cases multiple LEDs don’t “push” the light out as well as a single LED housed in an optimal fixture. Most of the time the brightness of an LED flashlight is determined by the mirrored housing and how it’s aligned with the bulb. A single LED bulb can often be just as bright, if not brighter, than multiple LEDs provided the mirrored housing is optimized for that one bulb. 4 – Brightness: Obviously this is going to correspond with the bulb type you get, but here’s a key takeaway about brightness. With the advance in flashlight technology there’s been a big push for brighter and brighter lights. There are some small, handheld flashlights that are capable of shining over a quarter mile. But ask yourself…do you really need that? Probably not. I’m not saying ignore brightness altogether but bear in mind what you’ll be using your light for. In many cases you’re going to use your light for simple tasks, things like getting light in your campsite as well as the path you walk on at night. However, that doesn’t mean there won’t be times where you don’t need a little more light. And also remember this…just because a light advertises it has a certain brightness if it’s cheaply made then that brightness might not be as powerful as advertised. Here’s a chart outlining what flashlight brightness means. My suggestion is to get one with 100-200 lumens. This will give you ample light to help in the dark and won’t drain your battery either as more powerful lights have a tendency of doing. One other thing to look out for is if the light has multiple brightness settings. These can come in handy when you need to switch to low light for either a tactical purpose or to save power and when you need to boost power so you can see a long ways off. Some lights will have anywhere from 2-4 brightness settings. 5 – Weight: Weight is a huge consideration when you’re selecting a survival flashlight. 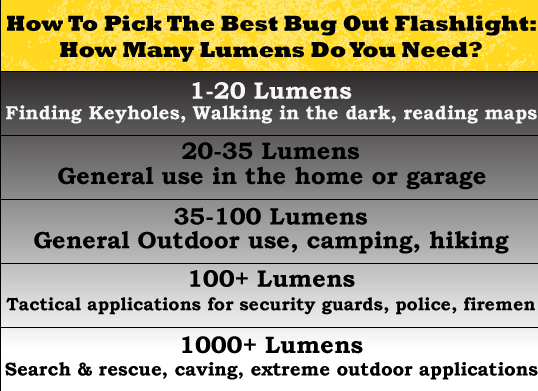 This holds especially true when you’re looking to select a light for a small survival kit or bug out bag. Think about it this way. If you’ve got a bug out bag with tons of survival gear stuffed inside you want everything to be as light as possible. And the difference of a few ounces on a survival flashlight really can make a difference if you’re forced to trek for miles on end. In general you should look for a light that’s less than 8 oz. in weight. However, the odds are you can find lights that meet all of your needs for less than 4 oz. The bottom line the lighter the better. Also, remember this. The dry (or empty weight) of a flashlight might be under 8 oz. but you need to think about what kind of batteries you’ll be using in the light. A flashlight that uses 3 D batteries and is under 6 oz. is going to come much closer to a pound in total weight when all is said and done. Plus, you’ll likely want to have backup batteries to take with you so you’ll want the lighter ones when possible. Traveling light is very important, and selecting a flashlight within the prescribed weight range will make survival a whole heck of a lot easier. 6 – Emergency features: Remember, a survival flashlight isn’t just something you’re going to pick up from the hardware store to help sweep your garage out when the SHTF. They’re designed specifically for emergencies which is why it’s incredibly important to get ones that have built in survival features. These features are quite useful and could even help save your life. One of the most common built in features associated with survival flashlights are emergency strobes. There are several different strobe patterns, but one of the most useful is the “SOS” strobe. Generally you activate the strobe by pressing the flashlights on/off button until it selects the strobe. Then you just let it run. The light will flash in the universal signal for distress and if people are near by they’ll be able to respond to you. Another strobe feature would be a quick strobe used in tactical situations. This strobe turns the light on full blast and then causes the bulb to strobe quickly. Aim this at the eyes of an intruder or an assailant and it will blind them in a flash (pun intended). This feature can help you defend yourself if you’re ever being attacked by someone. 7 – Self-defense options: This ties right in with what you just read about the strobe light. Many survival lights also double as tactical lights. And whether you knew this or not, many of these lights can also be used as a weapon. Some of these lights have something known as a “crenulated bezel”. This feature allows you to use the bezel as a striking instrument. Imagine crashing this into the face of an attacker…it’s not going to end up well for them. These bezels are sharp, multi-pronged and made to withstand severe impact. It’s for that reason if you’re looking for a great survival flashlight you ought to consider purchasing a light with those features. Of course this isn’t a requirement in a survival light and many of the other features listed above rank higher in order of importance. But, if you have to choose between two lights with similar features and one has a crenulated bezel and the other does not it certainly would be helpful to choose the former over the latter. Also remember what I mentioned about the strobe patterns. These are quite helpful for self-defense. If you’re a gun owner the combination of a light with tactical strobe and a gun can make a powerful tool for self-defense. 8 – Additional features: Additional features run the gammut and none are essential for helping to select a survival light. However, you might find some of these to be quite useful and their absence on a light might also make you want to avoid said light at all costs. Rubber on/off switches: These are durable, comfortable, and waterproof, giving you a solid switch for repetitive use. Clips or key rings: A clip on the side of the light allows you to secure the light inside of a pocket like you would a pen or a knife. A key ring gives you the ability to attach your light to a key chain or a backpack for immediate access. Switch lock: These prevent both the accidental activation of your light as well as helping to keep the light on when in use without fear of it being switched off. Included carrying case: These are helpful if you want to carry your light on your hip or on a vest or jacket. Make sure it has a good cover that won’t pop open with slight disturbances. Not A “Survival FlashLight” But Great For Survival! Right now we’re in discussions with top manufacturers in the survival world to get new products in that’ll help meet you needs. 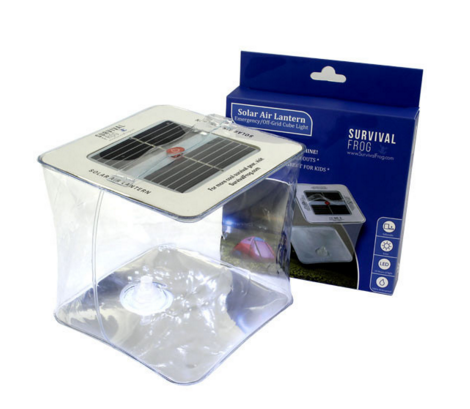 And although I didn’t mention it, one of our most popular and most versatile survival lights is the Solar Air Lantern. This compact, inflatable, solar charged light gives you long lasting and bright light with a simple charge from the sun. It’s affordable, reliable, and great for camping, survival, backpacking and more. Click here or on the image below to get your Solar Air Lantern now! 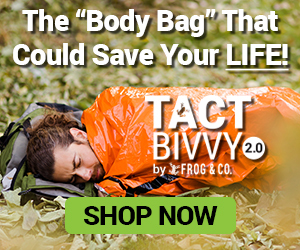 This entry was posted in Emergency Preparedness, Emergency Survival, Family Survival, Prepping and tagged emergency lighting, flashlight, flashlights, survival light on January 6, 2016 by Survival Frog.